Can You Believe Owen Nolan!! On Wednesday January 30, 2008 the Calgary Flames played the San Jose Sharks. Winning 5-4, the three goals made by Owen Nolan were incredible, and let the flames to a victory. But the talk of the game was the hat trick used by Nolan to secure the lead of the flames. Owen Nolan was on fire!! It was hard to believe that I missed that game, but watching the goals of the week on Global, I was lucky enough to watch two of the most beautiful goals made by this increasingly talented hockey player. The first was a miss communication made by the goalie of the Sharks, Evgeni Nabokov, when he was shooting the puck to one of his players down the ice, he miss-interpreted the shot and sent it right to Nolan, who basically had an empty net, which he then sent the puck flying into!! 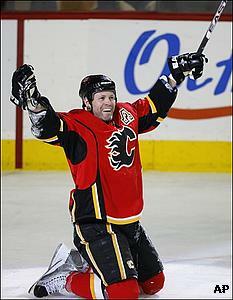 The other goal was the hat trick used by Nolan to secure the 5th and final goal for the Flames that night. Also, Nolan also showed that he can still fight with the young boys as he got in a fight with Sharks player Mike Grier ,the assistant captain to the Sharks. And this wasn’t just any school yard fight, Nolan was using uppercuts on Grier, really getting him where it would hurt. This wasn’t a sissy hockey fight as sometimes they usually are, this was Nolan pounding away at Grier. IT WAS AWESOME!!!! Who ever said aged mattered was wrong!!! According to team mate Dion Phaneuf, “Age is just a number, he always says that, and he showed tonight that he still has lots of game in him.” Owen Nolan still has many year left in him as a hockey player, and as long as he still makes goals like he has been, he won’t be let go any time soon. Here is a video of Owen Nolan fabulous night. Check it out, or you’ll wished you had.